Added INSSMB, an installer script to use a Samba source. I had not expected to see the Samba network installation choice appear in this release… I wrote this fairly recently and it was targeted to be added only after 12.2 was officially released. Anyway, it is nice to see it appear now. All you need to use it, is a Samba share (using a Samba or even a Windows server) that does not require authentication. Hope you all like it! 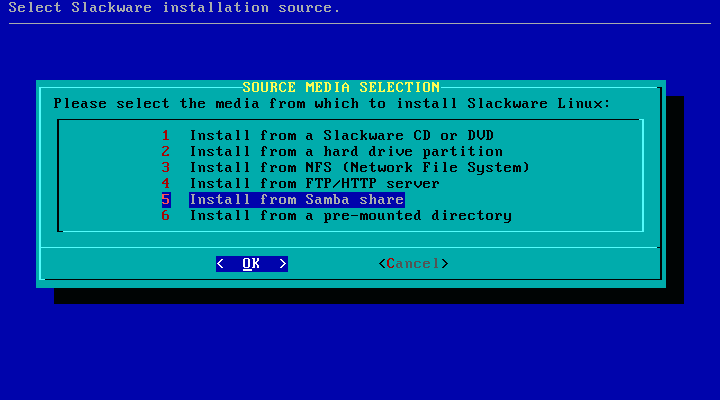 It will certainly make life easier for those who only have a Windows server to store the Slackware directory tree on. At the same time, we (the http://slackbuilds.org admin team) are working hard behind the screens to get all the SlackBuild scripts in our “12.1” repository validated for the new 12.2 release. We have asked all maintainers to test their own contributions when possible, and for those who do not have a slackware-current system available, we will do the validation ourselves. The http://slackbuilds.org web site is already prepared, so the update should be fast and painless. Posted: 9 December, 2008 in Slackware. BusyBox 1.12.2 compiles fine when statically linked. I know. I have busybox 1.21.1 in my test version of Slackware which also compiles file with a trivial patch. I also have the framework in place to support root=LABEL but have not had the time to test this. My development version of the Slackware installer allows for the automatic creation of an initrd (by incorporating mkinitrd_command_generator.sh functionality in liloconfig). Re-vamping mkinitrd and lilo is a project by PiterPUNK and myself, but it is not targeted at Slackware 12.2. Hopefully we will see it added to slackware-current sometime next year. It is up to Pat to accept our modifications.